Newcastle Eagles have been crowned British Basketball League champions for the sixth time after beating Surrey United this afternoon. The Eagles won 106-58 in their final Championship game of the season. 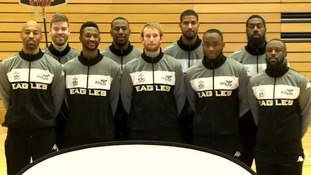 Newcastle Eagles could all but secure the British Basketball League title this week. The Eagles, who are eight points clear at the top of the Championship table, host third placed Sheffield Sharks tomorrow night. Speaking ahead of the game, player-coach Fabulous Flournoy said: "The outcome will decide basically who is going to win the league." Fab Flournoy: Esh Group "have been tremendous"
Newcastle Eagles player-coach Fabulous Flournoy has praised the decision to change the club's name to Esh Group Eagles Newcastle. The club announced the move at a press conference this afternoon ahead the start of the new British Basketball League (BBL) campaign.